The first-shape Jaguar XKR left me with one of the most confused verdicts I have ever drawn to on evaluating a car. 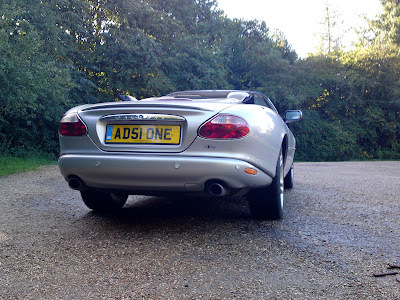 Back in 2003 an XKR with a few decidedly non-catalogue optional extras served as the Baddies car in terrible Bond flick Die Another Day, and, let's face it, that's pretty much the best bit of advertising by association you can buy. Jaguar have enjoyed a reputation over the years for building cars for bounders and cads, the kind of scoundrels you might expect to chase 007s Vanquish and fire rockets at it. 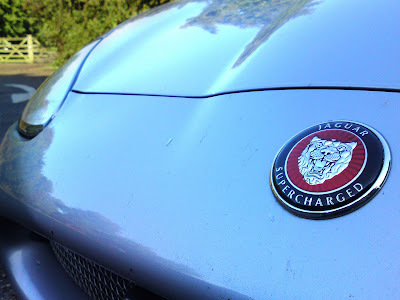 I enjoyed some of that feeling in the XKR. A Jaguar of the old school, it still exudes some of the raffishness the company seems to have built its reputation on, a likeable, Raffles the Gentleman Thug from Viz kind of persona. It's still a bit of a show-off's car. with the roof down the waistline is unfashionably low and much of my upper body is exposed to public glare. In all honesty I'm not really brave enough to revel in the sort of attention this car can still garner after all these years, with its mellow rumble bouncing off cottage walls as I drive through sumptuous Suffolk villages. This is one of the most cramped cockpits of recent times, the seat just doesn't seem to go low enough to prevent me butting the header-rail on entry, but even my 6'5" frame is still comfy enough once installed. Happily, the fact that my head is too high does at least afford me a terrific view down that magnificent country estate of a bonnet. As I sit, I realise that it isn't cramped, it's cosy. I also marvel at how the materials were so much nicer than I remember them being, and considerably nicer than you'd find in a far newer X or S-Type. All plastic surfaces are pleasingly dead and anechoic to a finger tap and the wood has a glorious lustre and must have been lacquered to wading depth. 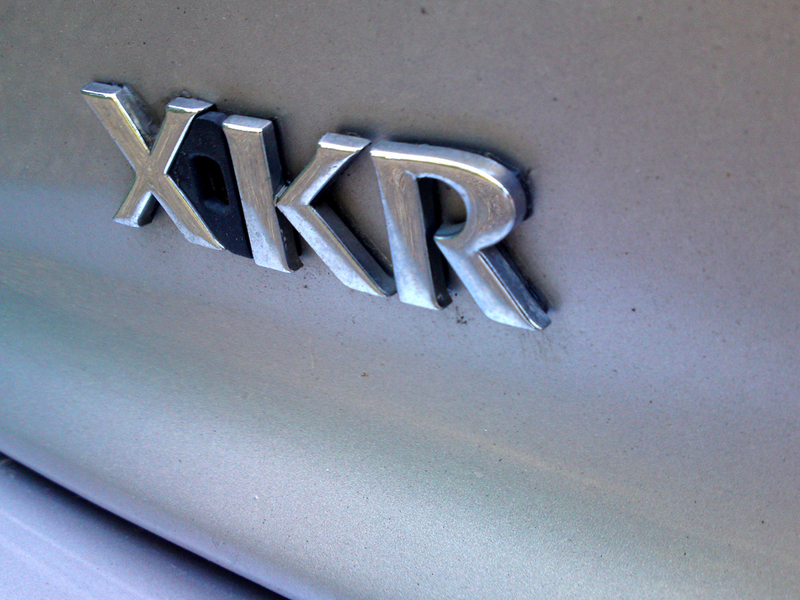 I had driven XKRs before, but not recently. It could be the fact that I have got used to ever more powerful machinery in the intervening years, but I'm sure I remember the supercharged AJV8 delivering more savagery than in this particular car. It doesn't have the whip-crack standing start acceleration that circa 400bhp should provide, perhaps some of those horses have gone lame since it was built nine years ago. What it does have, though, is a seemingly bottomless pit of constant, seamless acceleration. Plant the throttle from a rolling start and the incredibly long gears take you around the clock with extremely decent haste, it feels more like a hydraulic ram than a catapult, but it's definitely still quick by anybody's standards. 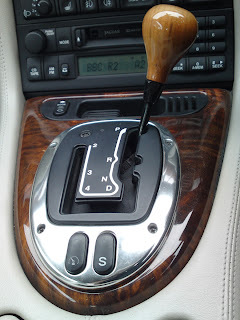 Mention should also be made of the sports mode, which does more to sharpen responses in this car than in plenty of others I could mention, even if that traditional J-Gate automatic gearbox has something of the Victorian signal box about it when you select gears manually. Strangely, I rather like it, but I can understand why Jaguar have moved away from it for their new models. Maybe the sixty-eight thousand miles on this car have gone straight to the dampers, but it isn't the last word in responsiveness. In fact, he entire experience reminded me what motoring enthusiast of yore must have meant by "barrelling along". In truth, it's a very pleasant experience. I would liken it, in an overwhelmingly positive way, to being at the helm of a well-poised and particularly powerful speedboat. Plant the throttle and the bow lifts, you feel the props cutting into the water. You are then thrust, very smoothly, towards the horizon, lifting only when you run out of space. This slight boatishness makes for a very relaxing time behind the wheel when driving at seven-tenths. There is a little dive, pitch and roll, but that all adds to the regality of the experience and alerts you when the limits are getting closer. There is plenty of grip, those 19s see to that, but dial in a little more exuberance and you better make sure you have plenty of road to play with. At one point, while barrelling, a slight evasive manoeuvre due to a Volvo driver with middle-of-the-road leanings caused one of the rear wheels to meet the muddy verge, breaking traction and sending the back end sideways for my next corner. I was immediately reminded that this is a very big car. There is a load of pendulum to look after and those big overhangs and comparatively short wheelbase can promote some waywardness, especially when the blower is blowing. 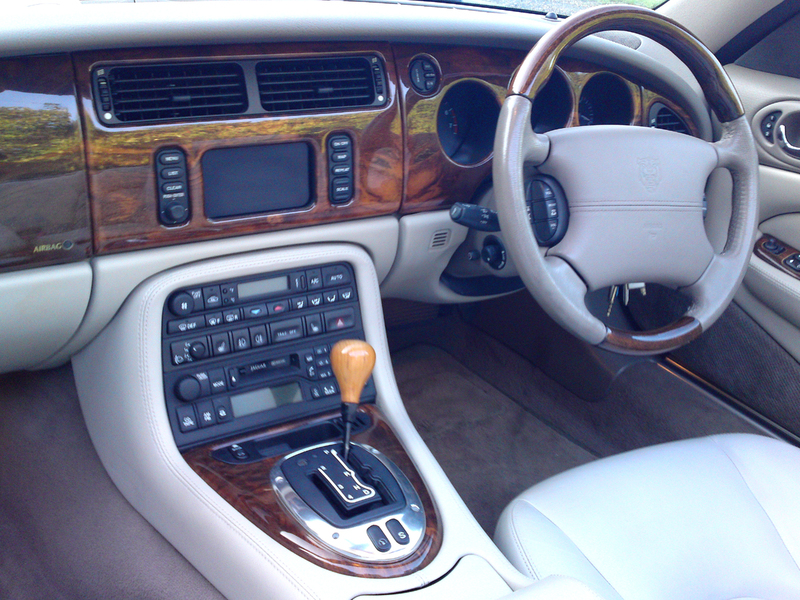 I'm inclined to think that, despite appearances, sports car isn't the XKRs favoured job description, in fact I should have realised that when I first saw all that wood on the dashboard and steering wheel. It always tended to be labelled as one, but we should remember that big chunks of the chassis can be traced back to the XJS, a marvellous car but as sporty as jam-making. It does make a rather compelling case for itself, though, as a GT car. Ignore the rear seats, or take them out and burn them for being utterly useless. Better still, put a couple of soft bags there to expand the surprisingly reasonable bootspace. Slide behind the wheel and adopt a semi-reclined driving position and feel the miles pass under you. Last year I was weighing up the pros and cons of where Jaguar have been recently versus where they're planning to go in the future. The fear was that all those qualities they're associated, both for better and for worse, would be abandoned in favour of a clean slate approach, but thankfully Jaguar have managed to avoid being reckless. I would award them only partial credit for the XF, the dramatic impact it had at launch hasn't lasted particularly long and that DB-9 Aston-Martin inspired shape still reminds me too much of a Lexus. The XJ is altogether more successful, the nose is how the XF should have looked, there is some beautiful detailing and an inherent rightness to the proportions even if a few features still Irk me (rear lamps, although they do look fabulous at night). If magazine impressions are to be trusted the next small Jaguar should be pretty special, too, and damned good fun to drive. I would like to take attention away, though, from the industry fascination with everything becoming more dynamic, somehow sportier. 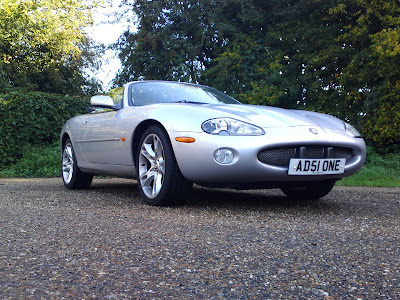 The current XKR is a far more aggressively set-up car than the old shape, I would ask if it really needs to be. I would wager that few people buy today's car principally for its firm ride, in a market flooded with sports cars maybe Jaguar would be right to realign it as a slightly more genteel tourer, or at least offer that as a chassis set-up option. Certainly this old car you see before you offers an intoxicating blend of performance and relaxation, and will take you on a trans-continental blast in far more comfort than, say, a Porsche 911. I wasn't sure whether to be disappointed, impressed or confused by the XKR. I ended up being all three. Actually, In the end, everything considered, I think I love it.